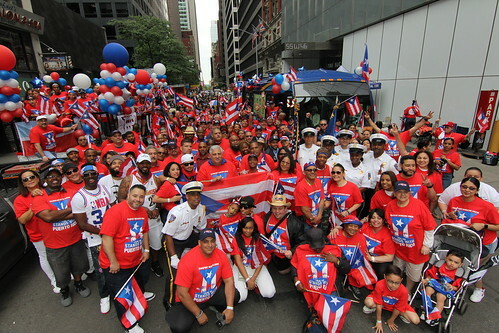 Over three hundred transit workers brought activism and excitement to the annual Puerto Rican Day Parade, marching proudly up 5th Avenue. Led by the Local 100/MTA Ceremonial Honor Guard, we paraded in bright t-shirts -- Bus Operators, Conductors, Cleaners, Mechanics, Train Operators, Track and Signal Workers, and numerous other titles. Some pushed strollers and brought their entire families. Attending were President Tony Utano and Administrative VP Nelson Rivera, as well as Vice Presidents Joe Costales, Derrick Echevarria, Richie Davis, and Pete Rosconi. President Tony Utano and Administrative VP Rivera marched earlier in the day with New York State Governor Andrew Cuomo and Lt. Gov. Kathy Hochul. Later, the TWU contingent turned on to 5th Avenue with a float with a DJ that enlivened the enthusiastic crowd, and a City bus. The New York Times covered our entry, noting that the float told a story of sadness and anger: "4,645: TWU Local 100 mourns the heartbreaking loss of life from Hurricane Maria! Message to President Trump! Puerto Rico's recovery has just begun!"